I’ve decided to continue with the kinetic typography task we were set, although this time I’m going to do it a bit differently. Instead of creating a 2D text animation using Adobe After Effects, I am going to create the work using Blender, to produce a 3D animation. I researched some 3D kinetic typography examples, and picked up on some common practices in the area. Something that interested me was that some of the examples I saw used a mix of 2D and 3D text to create a unique effect. One such example of this can be seen here – http://vimeo.com/57485219. I thought for a while about what audio I should use for the animation, before deciding that for this piece I think it will be interesting to use the same clip from Gravity as before. Using the same clip will help me compare the two styles of kinetic typography and allow me to further improve on the existing ideas and themes I have already implemented in the previous animation. I expect that I will be further experimenting with kinetic typography in the future, in which case I will use a new audio clip so that I can improve a wider set of skills. I’ve taken it upon myself to learn some more advanced techniques when it comes to producing things with Blender. I browsed the internet for tutorials and inspiration, and a few videos caught my eye. One of these was a tutorial on fluid simulation from the Blender Guru. While much more advanced than the things I had already tackled with the software, this was an aspect that really interested me and I decided to challenge myself and learn something new in the process. I first went about modelling a glass for the final image that I would be producing. I approached this from a different way than was covered in the tutorial, as I wished to develop my own technique for doing some things in order to actually learn the tools of the software rather than just clicking what I was instructed to. I did this by first adding a spherical mesh, and then scaling and removing parts of the object until I got the desired shape. I then followed a part of the tutorial in adding ‘ridges’ to the glass, as this allowed me to learn about the ‘loop cut and slide’ feature for doing things such as this. After doing this I had a glass model which looked like this. After creating the model for the glass, I then had to apply a material to it in order to make it look like glass. 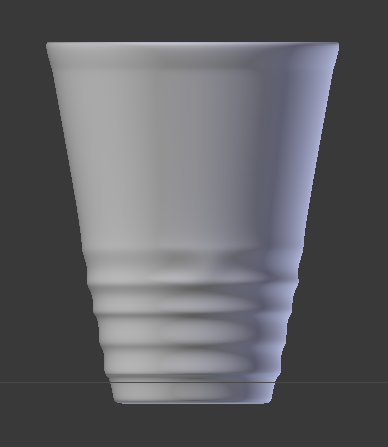 Handily, there is an option for a glass material built into Blender, so this was quite a simple process. 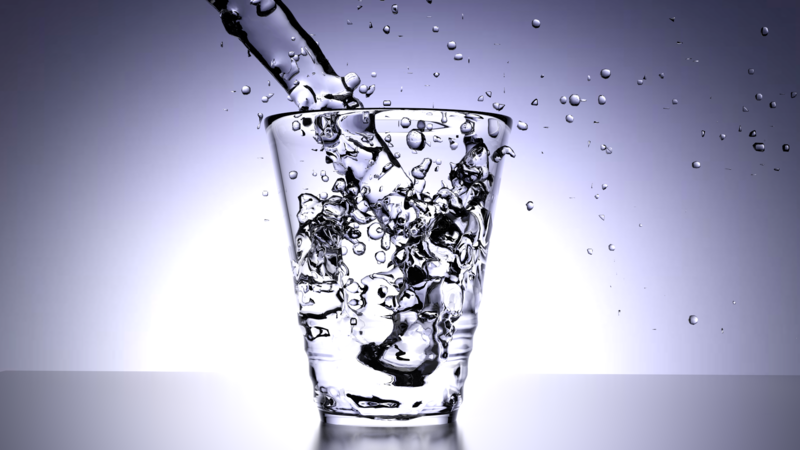 After I had done this, I started on the water which I would be showing pouring into the glass. My initial plan for this was to produce an animation of water pouring into and filling up the glass over time, which I would then render out as a video. However I soon realised that the fluid, when poured into the glass using the fluid simulation engine, was left with unnatural, zigzagged edges that would require me to freeze the water in place and manually smooth out using the sculpting tool. 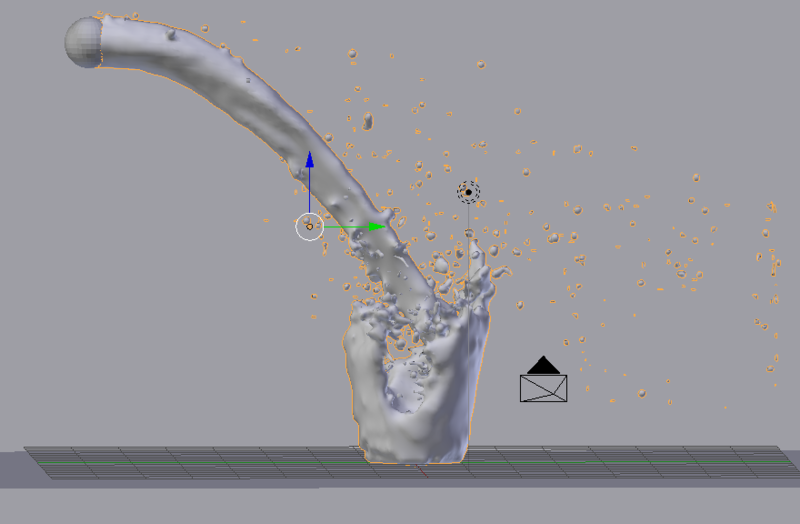 While this was good as it let me learn about the use of this tool, it made it much harder to do an animation of the fluid as each frame would likely require redoing and smoothing the fluid simulation by hand. This, combined with the long render time that would come with producing a 3D animation, would make following this idea very complex and time consuming. I therefore changed my plan to produce a single, high quality image of the water in action. After finding the frame I thought looked the best, I then performed the necessary smoothing using the sculpting mode. Once that was completed to a satisfactory level, I again applied a glass material to the liquid, only this time I also modified the refraction index of the material to that of water, to make the ‘glass’ material’s aesthetics more in line with water. I then added a glossy plane for the glass to sit on, and a light emitting plane to go in the background of the image, which I textured with an image found online to give it a nice, gradual increase in light from the edges of the image towards the glass in the middle. I think this helped to frame the glass well and made the shadows and highlights in the image look more realistic. After this was done, I found an appropriate camera angle, checked and adjusted the lighting provided by the backing plane, and then performed a few test renders, tweaking the composition of the image slightly each time until I was happy with the result. Once I was, I upped the quality settings of the render, and rendered the final image. The final rendered image of my fluid simulation experiment. This image I am happy with, as the production process behind it has taught me quite a bit about Blender and how best to perform certain tasks within it. There are a few flaws with this result, such as a few droplets which are unnaturally flat/triangular, a problem which I believe stemmed from them being accidentally smoothed too much while in sculpting mode. However, these are issues which can be worked out and improved upon in projects I work on in the future, and I am glad that I took the time to experiment and produce this work on my own as I have learned a lot in the process. We’ve recently been introduced at Uni to a piece of software that goes by the name of Blender. I have been aware of this open-source 3D modelling and animation program for a while, however I have never personally tried it out or done any 3D work at all. I am excited to get into it, and have started with a few simple creations. The first thing we went over was how to manipulate text. 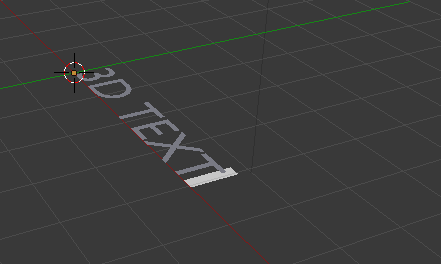 I typed some sample text and went over the very basic task of extruding it to make it 3D. Inputting simple sample text in Blender. With a bit of magic (and extrusion), the text is now 3D. Blender is a program that interests me, and that I plan on using a bit more to learn the techniques of 3D modelling and animation. While the things that I have done with it so far are very basic, the software has the potential to create complex and visually impressive images and animations. I look forward to seeing what I can do with it. The future of my website and personal branding. I have plans for my personal portfolio website. Plans which I am excited to work on, and which may eventually lead to a complete overhaul of the site. However, I am at the moment caught up in the middle of this Media Practice Portfolio project, and I am putting the improvement of my personal website on hold for now. I will run through a few of my ideas in brief here though, just to have them somewhere other than my head. Part of my formative feedback from my lecturers on the site was that it has no strong sense of branding. My ‘logo’, if it can be called that, as it stands is simply the letter A in a circle. I can do better than that. I have started coming up with new ideas for my personal branding, and have started with logo design. At the moment I am running with designs based around my surname, Baker. I’m doing this because it’s important to me that the site does not start to feel too corporate or impersonal, and I want to keep a strong sense of my own personal connection to it throughout. My initial logo experiments have been based around the iconic baker’s/chef’s hat. I think that this is something that is easily recognisable if portrayed correctly, and has enough of a connection to my name to establish a branding around. It does however run the risk of confusing people, and I obviously do not wish to be mistaken for a bakery. My initial attempts at baker hat themed logos, done in Adobe Illustrator. I am not entirely sure whether I like this idea or not as yet. I will continue to develop different concepts and ideas for my website and branding throughout the coming weeks. The kinetic typography project was something which interested and inspired me. As part of my research I saw some really great examples in the area, and they gave me some insight into the techniques and ideas that should be considered in producing a successful end result. I also learned a few helpful things about Adobe After Effects, a piece of software which I had previously only had limited experience with using. I look forward to experimenting more with the software and it’s various capabilities in the future. In regard to my Gravity animation, I am generally pleased with the outcome, although I think that due to artistic choices previously mentioned as well as a lack of experience with the software used, the animation is fairly simple and therefore not the best exercise for teaching myself advanced techniques. I intend to take a further look at a kinetic typography project at some point soon, and there are a few things I plan on changing from this first attempt. For example, next time I would like to use an audio/video clip which moves along faster and/or has more words present. I think this will result in a more challenging animating experience, and allow me to experiment and try out more styles and techniques of kinetic typography. Overall though, as a first foray into the medium as well as a learning exercise, I think the project has served me well. I have developed a greater appreciation for the sorts of high production value kinetic typography pieces that are out there, as well as a desire to improve on my own skills. A task with a certain Gravity to it. In taking on this kinetic typography task, I first looked around at other kinetic typography videos, hoping to draw some inspiration and learn about some common practises of the format. I soon saw that there was a wide variety of ways to approach the subject. As well as the differences I mentioned previously on whether to include the original video or not, there are many different aspects that set one piece of kinetic typography apart from another. How many words are displayed at once can make a big difference in the final video. The text can be jumped through one or two words at a time and quickly disappear from the screen by whatever means, or entire paragraphs or sections can be displayed at once, with each word being added on to the screen while keeping the previous words visible. This can have a large impact on the feel of the animation overall. If very few words appear at a time, more attention is drawn to them and the viewer is more likely to be reading the right part of the text at the right time in relation to the audio. However, this comes at the cost of possibly leaving people behind if the words are displayed for too brief a period to read and make sense of. In contrast to this, displaying whole sections of typography at once can help group the text into logical sections, which the viewer will then regard as a cohesive segment, possibly all connected to the same idea. This can have the drawback, though, of having a lack of focus on a specific part of the audio as the viewer could be reading any part of the previous text. Some techniques can be used to somewhat rectify this, be it by emphasising the animations of key points in the text or by using different fonts and colours to grab attention to the desired section. The use of colour in these pieces is also another thing I took into serious consideration. While a lot of the videos I saw used several and varied colours throughout them, some only used a few. One video that I saw and will link here made particularly effective use of only two colours – in this case a near black and white. This example also makes very good use of another feature I identified in some kinetic typography animations. This is the use of illustrations outside of the text, as well as creative use of the text in suggesting shapes and ideas. For example, the words “hair extensions” can be seen to form an image of hair on a woman’s head at 2:50 into the video. This technique as well as having illustrated images mixed amongst the text is very effective at emphasising the key ideas of a section of text, as well as making the animation more visually impressive. However, excessive use can have the effect of making the scene feel cluttered or overly complex – something which I have decided to avoid in my Gravity piece, as I think it would work against the theme of the source material. After thinking about all of this, I made a number of decisions about my intended outcome early on. These were primarily to keep the scene simple and free of clutter, to use generally only black and white, and to display only a limited number of words at a time during the animation. The reasoning behind these choices was based around keeping my work in line with the theme of the source material it is based on (Gravity/its trailer). I chose to use a monochrome colour palette as I hoped this would evoke the idea of being in space and cause a general atmosphere of emptiness and being alone. I think this fits well with the film, and particularly the short section that the audio I’m working with was taken from, as it occurs when one of the characters is out in space alone and is struggling against the emptiness all around her. I later decided to use two main colour layouts – both white text on a black background and white text on a black background. I did this to differentiate between the two characters in the clip. The white on black I used for the female character lost in space, as I think the black background serves this metaphor well. I used black on white to portray the male character communicating from a control area, as I think the (actually slightly off-)white background has a clean, almost clinical feel about it, which gives the sense that the voice is coming from a different, and safer, location. Only having a few words at a time on the screen was a choice I made to try to emphasise the urgency of everything that is being said. This is a scene without much unnecessary talk, and everything that is being said is towards the goal of potentially saving a life, so I thought it appropriate to make the visual representation of the dialogue short and rapid. This is also why I avoided excessively complex animation of the text, and instead used largely uniform animations or fades for the text, only embellishing certain points further to convey additional meaning (for example the text shrinking at the very end, meant to suggest a camera zooming out to show the true extent of the nothingness all around the subject of the clip). I think this all worked well, and am reasonably happy with the result even if it is a little simple, but you can judge for yourself. My finished kinetic typography animation for the Gravity trailer can be viewed here. The projects keep on rolling in, and this time we’re taking on a brief based around kinetic typography. This is a style of textual animation that involves written words moving around the screen, and is often used in several areas such as introduction sequences and trailers for films and television. The commonly accepted first well known instance of kinetic typography being used in such a way was by Saul Bass, in the opening credits for Alfred Hitchcock’s 1959 film North by Northwest (Lee et al 2013). Kinetic typography is also commonly used to accompany an audio clip of a person’s voice, whether giving a speech, singing, acting or any similar activities. There are two main approaches to this when it comes to working with a video source – namely layering the text over the existing visuals, and removing the video altogether and creating a new piece out of the motion type and the audio track. Each of these has advantages and disadvantages, and each is well suited for dealing with different source material, depending on what the creator wants to be portrayed through the typography. By utilising the video and adding the text over it, there is often a greater potential for keeping the context of the original scene, as the viewer can easily see the setting, characters and events unfold while reading the typography. This can be lost if the video is removed, however the lack of extra clutter generally makes the text itself the primary focus, which draws attention towards what is being said rather than what is happening visually. The text can also be manipulated to give a sense of the original scene, such as by making shapes out of the words or animating them in such a way as to suggest the action of the video. The brief set by the university is to create a 15 second kinetic typography animation from a video/audio clip. We are free to choose our own source material, although a portion of the trailer for the film ‘Gravity’ has been given to us to work on. I have considered what I want to do, and I have decided to use the provided material. Some of my peers have expressed disdain towards the video clip, noting such flaws as excessive repetition and lack of any real meaning once the video is stripped out, and I admit the clip may not in fact be perfect for the task. However, this is why I have chosen to pursue it. I believe that working to a brief, flawed or otherwise, will be good experience for the professional world, and I will gain more from challenging myself to adapt to a provided clip than going out and finding an easier one. With this in mind I aim to produce a piece which fits the mood of the trailer, but which also provides value as a standalone object, not requiring the trailer to have been seen or any prior knowledge of the movie to be held to be appreciated.